Beautiful abstract animal print in brown & black or purple & Brown colors. 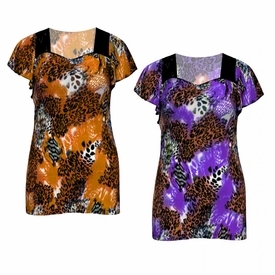 This pretty shirt has short sleeves and a squarish neckline that has black lace on the sides. Pair with jeans or a solid color skirt to complete the look. 4x - Chest: 54" | Hips: 62"
5x - Chest: 60" | Hips: 66"
6x - Chest: 62" | Hips: 68"